At a charity event last Sunday (September 24, 2017), Houston Mayor Sylvester Turner wholeheartedly acknowledged the impact of humanitarian efforts and philanthropic initiatives by Indian Americans, in general, on the socio-economic progress of America. Undeniably, the growing Indian American community is a pillar of the US economy though it constitutes only 1% of the total US population. Tampa-based Freedom Health’s Chairman, Dr. Kiran Patel pledged a whopping donation of $200 million to Florida’s Nova Southeastern University yesterday when we at Indian Eagle were full of praise for Houston-based Amit Bhandari’s contribution of $250,000 to a Hurricane Harvey relief fund. 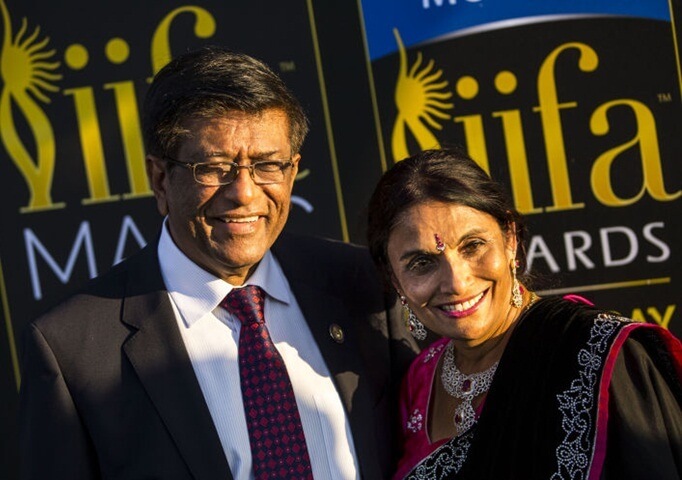 An eminent Indian American physician and entrepreneur couple, Drs. Kiran Patel and Pallavi Patel committed the single largest donation to a US institute in the history of America. Driven by boundless passion for philanthropy in health care and health education, Dr. Kiran Patel unveiled his plans to build an osteopathic medical college in Tampa for poor students from India and Africa almost a year back (2016 end). The Dr. Kiran Patel College of Osteopathic Medicine will come up at a new medical complex in Clearwater, under Nova Southeastern University (NSU). Lauded as the transformational contribution in the history of Florida, the promised $200 million includes a $50 million gift to Nova Southwestern University for healthcare advancement in Florida and a $150 million for medical facility development at the upcoming 325,000 square-foot complex in NSU’s new Tampa Bay Regional Campus, Clearwater. The Drs. Kiran Patel and Pallavi Patel Family Foundation’s partnership with Nova Southeastern University is expected to transform the face of health care in Florida, and in USA at large to the benefit of underprivileged communities. The Patel Family Foundation’s historic commitment of $200 million to NSU will also generate employment opportunities across Florida in order to make a big difference in the socio-economic scenario of the state. Sanguine about the partnership with Nova Southeastern University, Dr. Pallavi Patel, an Ahmedabad-born pediatrician, said that NSU would train thousands of new doctors and other health care professionals at different levels and in different fields over the next 20 years so that millions of lives could be benefitted in USA and India. Notably, NSU renamed its School of Health Sciences as Dr. Pallavi Patel College of Health Care Sciences, which resulted in a merit scholarship fund for student. Nova Southeastern University would produce 250 doctors a year in the short run and nearly 400 physicians over the next few years, according Tampa Indian American Dr. Kiran Patel. The largest producer of medical graduates in Florida, Nova’s School of Health Sciences will reportedly associate with the Dr. Kiran and Pallavi Patel University, which is currently under construction at a 120-acre site in India. 40% of medical graduates including doctors and physician assistants from NSU would practice in medically underserved areas worldwide, was a key condition of the $200 million commitment that Dr Kiran Patel and Dr. Pallavi Patel made to NSU. Medical graduates from India will also undergo training on advanced treatment methods during a year-long residency program at NSU’s new Tampa Bay Regional Campus in Clearwater. No wonder why the United States Citizenship and Immigration Services (USCIS) honored Dr. Kiran Patel with the “Outstanding American by Choice” award of the year 2017. This story is part of our continued effort at Indian Eagle to promote good work for noble causes by Indians in USA and the rest of the world. We not only strive to make USA to India travel cheaper but also cater inspiring stories, community news, and travel updates to Indian Americans through our free newsletters. Please support Indian organization all so. Pls help Indians also.n Indian organisations.